New Austrian Government Will Have A Far-Right Tilt : The Two-Way The country's chancellor finalized a deal Friday to form a governing coalition with a party that has Nazi roots. 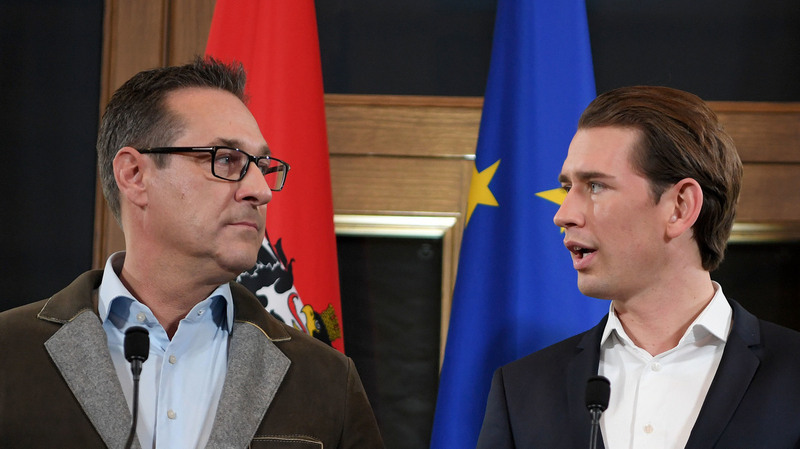 The leader of the Austria's far-right Freedom Party, Heinz-Christian Strache (left), and the leader of Austria's conservative People's Party, Sebastian Kurz, hold a joint press conference in Vienna on Saturday. Strache, who was once arrested for "taking part in a Hitler Youth-style torchlit neo-Nazi rally," according to British newspaper The Telegraph, will serve as vice chancellor and minister for sports and public servants, and his nationalist Freedom Party will have members in several key leadership positions including the interior, defense and foreign ministries. The Austrian People's Party will have seven ministers and one deputy, and the Freedom Party will have five ministers and one deputy, according to the Associated Press. On Saturday morning, left-leaning Austrian President Alexander Van der Bellen did not object to the new governing coalition, reports NPR's Soraya Sarhaddi Nelson. He "gave what looked like a forced smile in front of cameras," Nelson said, and cryptically told reporters "as much as a morning can be good, I bid you good morning." Austria is governed by a parliamentary republic. A president is elected every six years as chief of state, but the head of government is the chancellor, who is the leader of the majority party. The new government is expected to be sworn in on Monday. Austria will become the only Western European country with a governing far-right party. Kurz is currently the country's foreign minister, and he has "stressed the importance of a pro-European direction," according to the AP, although the Freedom Party, which has control of the foreign ministry, has traditionally been euroskeptic. Van der Bellen assured on Saturday, however, that in the party coalition negotiations, it was agreed upon to support a "strong European Union." The People's Party received 31 percent of the votes in October's election, the most of any party. The Freedom Party, which was founded in the 1950s by a former Nazi minister, came in second place with 27 percent. Many have voiced concern over the Freedom Party having a prominent role in the country's government. "It is sad and distressing that such a platform should receive more than a quarter of the vote and become the country's second party," said Ronald S. Lauder, the president of the World Jewish Congress, around the time of the election. "It is still full of xenophobes and racists and is, mildly put, very ambiguous toward Austria's Nazi past."